It's always nice when a Kickstarter is funding and then starts selling to the general public. Such is the case that we have here today. 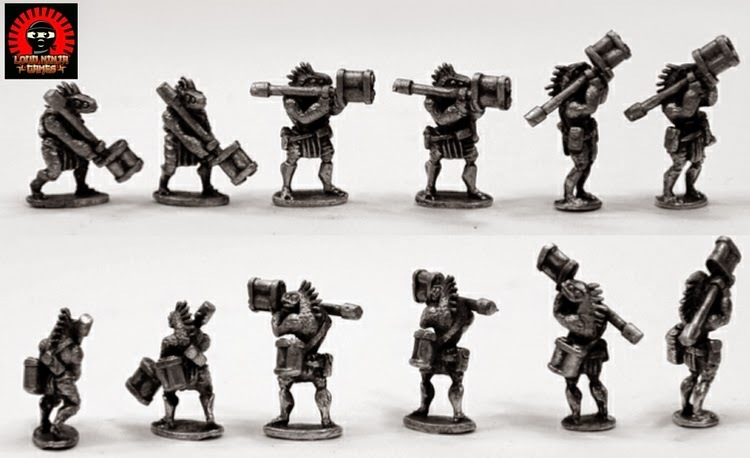 Paymaster Games has officially opened up their Pre-order store for Going Native, their skirmish miniatures game set in a fantasy version of Mesoamerica. All the kits from the Kickstarter up there for you to check out. New World Games has launched a Kickstarter campaign for Going Native: New World Monsters. These are creatures from various folklore traditions of North, Central, and South America. They're already 3/4 funded with still 31 days to go. They're great for games of Going Native, but also good for sicking on your RPG groups. 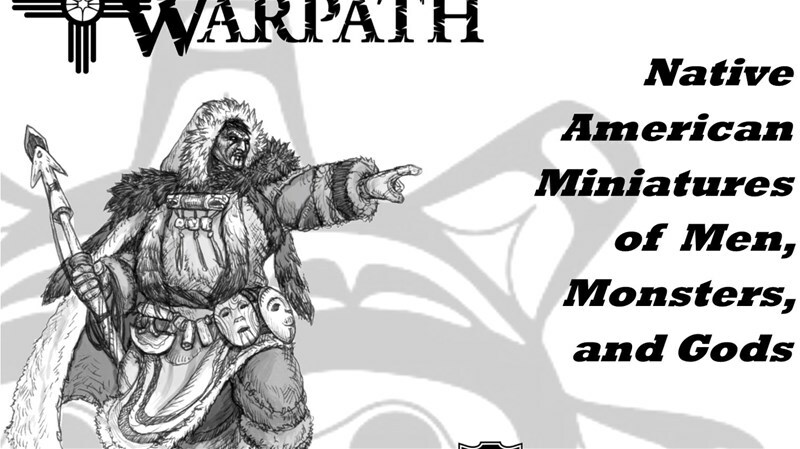 Paymaster Games has launched a Kickstarter campaign for Going Native: Warpath Warriors and Spirit Beasts minis. Going Native: Warpath is a miniatures based table top strategy game that focuses on the native cultures of the Americas and the Pacific. Two years ago, I launched a successful Kickstarter to create a game and a new and exciting line of Native American and Polynesian models. During the campaign, I ended up creating more miniatures then I could produce with the funds that I collected. The main goal with this campaign is to raise the money to send all of the models I have in to production. All models presented during this campaign will be cast in white metal in order to maintain the highest quality and quickest delivery. Paymaster Games made it past their funding goal for their Going Native game over on Kickstarter. They've still got some time left and have put up some videos about army creation as well as a bunch of new greens. To help us get to the Hawaiian Koa War Party i have added some old models that i made when i started my company to the add ons. Just to let you all know if we all up our pledges by $50 we will make it to Hawaii. Paymaster Games gave us just the silhouette of their Mystery Spirit Beast for Going Native the other day. Here's the full artwork. 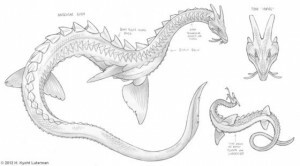 The Lake Monster found in the lakes of the americans are know by meny names, Ogopogo, Memphre, Nahuelito, Champ, Ouampenanagoag, just to name a few. But all of these bease share similar traits like a long neck, and is very long. 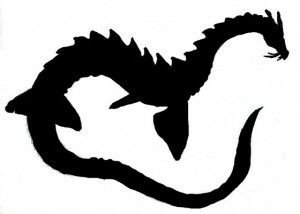 Some cryptozoological ideas have the american lake monster being a plesiosaur or ancient whale. Give the climate these monsters are found, others believe that they are much more likely related to a Sturgeon. This is a special Spirit Beast will be made available to all levels Warrior and above as a Spirit Beast add on upon reaching $7000. If we reach the $9000 goal by Tuesday 10/30, every one that has the Wise Old Fox level kit or above will recieve one American Lake Monster for no additional cost. Going Native is showing of the silhouette for their Mystery Spirit Beast. A mystery spirit beast has been spotted in the dark waters in the lakes of north and south america. This is a special Spirit Beast will be made available to all levels Warrior and above as a Spirit Beast add on upon reaching $7000. If we reach the $9000 goal by Tuesday 10/30, every one that has the Wise Old Fox level kit or above will recieve one of these Mystery Spirit Beast for no additional cost. 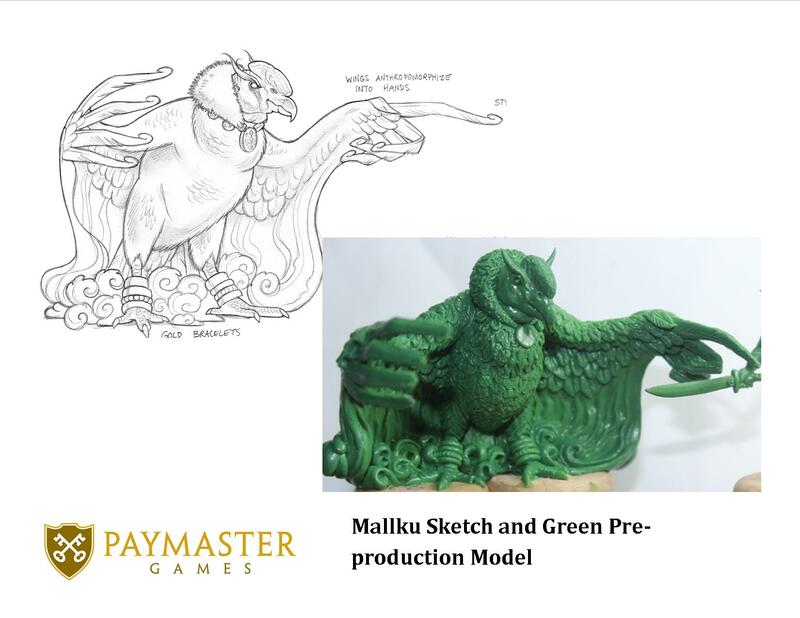 Going Native from Paymaster Games has made it up over their funding level over on Kickstarter. Woo! They've also posted up some artwork for the Mo'o. Check it out. As we work on the first strech goal, i wanted to show you the consept sketch of the Mo'o. The Mo'o is the spirit beast that comes with the Hawaiian Koa Starter Kit. The Mo'o is one of the most Common Guardian Spirits though out the cultures of the Pacific Islands. 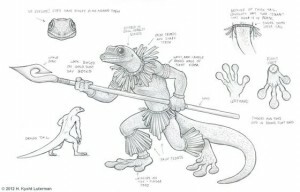 The Mo'o takes the form of a gekko, and it protects pools of fresh clean water on the islands. Paymaster Games broke through their funding goal limit! Woo! They're also showing off the green for the Pacific NW War Chief. Go look. 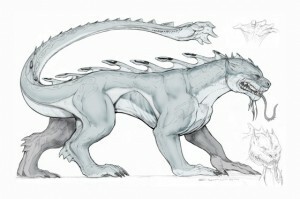 By request, there are now all model pledge options that offer Spirit Beast in place of Core Rule books. These all model kits are great deals. For example, the Wise Old Fox All Model kit offer 60 man sized models for $3 each and the 6 spirit beasts that come with the kit are free. These kits are limited in number, so you may want to jump on it while there are some left. 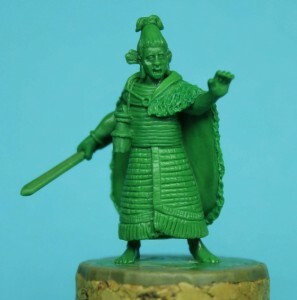 I am proud to announce that Ian Mountain just finished the Pacific Northwest War Chief. This is the planned War Chief for the Pacific Northwest Tribes War Party Starter Kit. This model was inspired by photos of the Kwakiutl (Kwakwaka'wakw) tribe taken in the early 1900s. Also by fan request, we have also made some avatars. Paymaster Games has also updated their Kickstarter campaign with a listing of what will be in each of the starter boxes for Going Native. 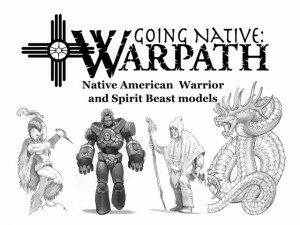 I have gotten the much requested contents to each starter kits of the Going Native: Warpath Kickstarter Campaign. 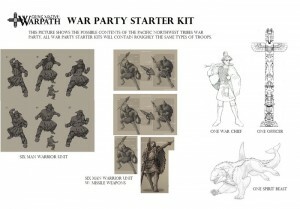 Each Starter Kit comes with 15 models, One War Chief, One Officer, 12 Warriors and 1 Spirit Beast. The Starter kits start at the $50 pledge level. Please Check it out. All of the pledge levels come with the Limited Release Monster Hunter Model. 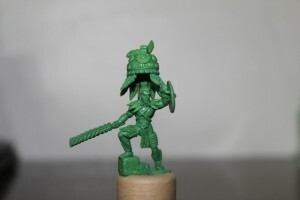 Paymaster Games gives us another look at what they've got in store for Going Native with a preview of the Ahuizotl Otter. As we Progress, it is time for another update. This update is to the Aztec Triple Alliance War Party Starter kit. The Spirit Beast that comes with that kit is the Ahuizotl Otter. Cryptozoologists believe the Ahuizotl Otter was once the largest Otter that has ever lived in North America and was native to the lakes and streams of Mesoamerica. According to the myths of the Aztecs and the other groups in Mesoamerica, The Ahuizotl Otter had a hand on its tail and often attacked and drowned people that wandered it to deep water. According to the logs of Christopher Columbus, he encountered one as it attack and killed a rather ill-tempered Spanish boar. The planned size of this beast is about 20mm to 25mm at the withers and will be mounted on a new style 40mm round base. 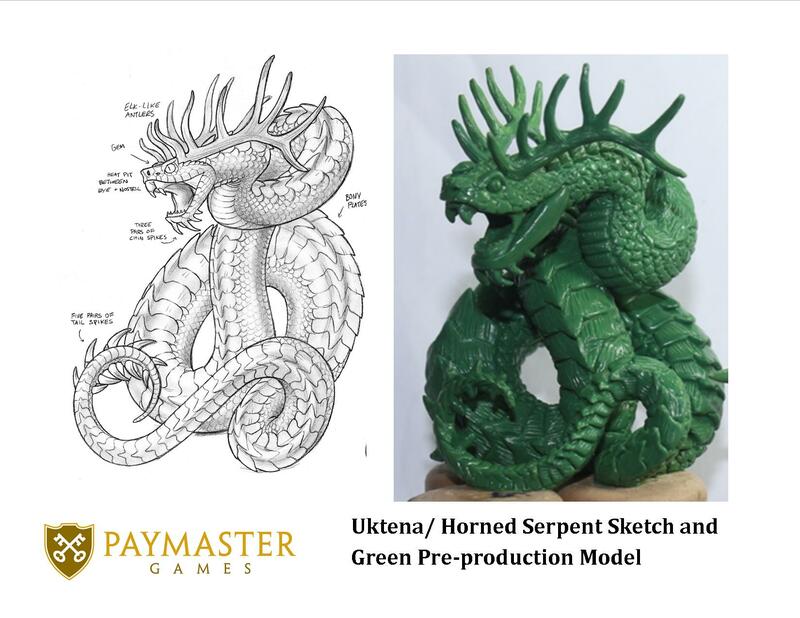 Paymaster Games has made it to the halfway point in their Kickstarter and has an update with a new green they're working on. This project is advancing better then i ever thought. We are almost to the half way point and it is amazing. Let me show you the War Chief of the Aztec Triple Alliance War Party Starter Kit - The Tlacateccatl. The Tlacateccatl was the second highest ranked officer in the Aztec army. In modern times this title is roughly equivalent to a General. The Tlacateccatl were members of the Aztec elite shock troops known as the Shorn Ones. Paymaster Games has started a Kickstarter campaign for their new minis wargame, Going Native: Warpath. Paymaster Games first game, Going Native: Warpath is set for release in the summer of 2013 and we are currently raising funds and selling preorders on Kickstarter. 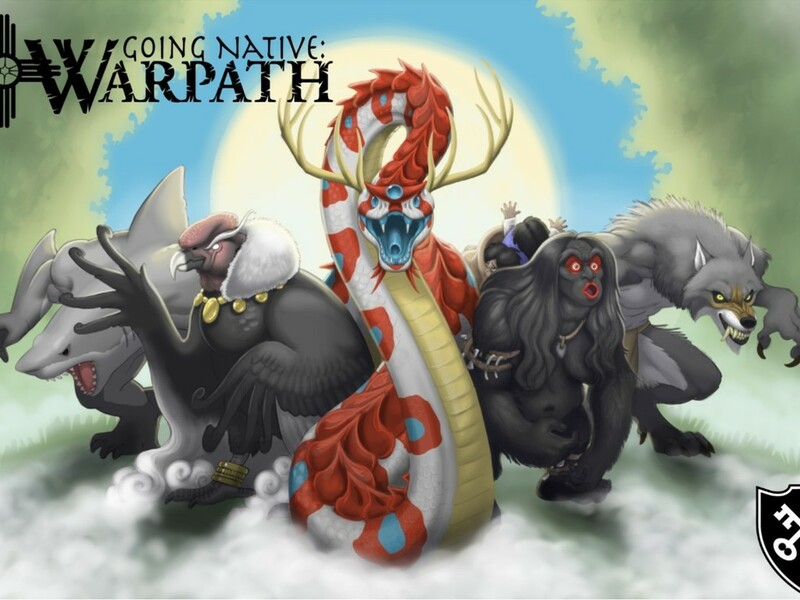 Going Native: Warpath focuses on the native cultures of the Americas and the Pacific and their mythology. We are taking a completely new approach to natives then other games; our game is set in a time before the Europeans arrived in America or the Pacific. Instead of large armies with several models that most historical games require that you make to, Going Native: Warpath takes different approach. Instead of large armies, GN:W forces are smaller and faster groups that resemble realistic War Parties that were formed when it was time to go to war. We also approached Native American myths and legends as well. Unlike the myths of Europe and Asia, the legendary creatures of the Americas are largely unknown to the average gamer or hobbyist. One of the goals of Going Native: Warpath was to bring these amazing and bizarre creatures to the table top for the first time. 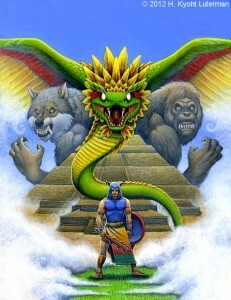 Your armies, referred to as War Parties in this game, would not only be able to field the better known American creatures like Feathered Serpents, Sasquatch, or the Thunderbird, but they would also get the opportunity to use fiery Cherufe, the powerful Piasa, or the seductive Deer Woman as well. Paymaster Games has their own Kickstarter campaign going to give you something you know you can never have enough of: dice. These dice are going to have Mayan numbers on them. The First of the projects that Paymaster Games has put up on Kickstarter is our Mayan Number Dice. These will be standard D6 dice that have had the normal numbers and replaced them with Mayan Numbers. Please Check it out. I know you guys were wondering if Paymaster had become a ghost ship website of sorts. But I have a lot of announcements. First off, we are proud to announce that we have entered the play testing phase of our new table top war game, Going Native: Warpath. This game is based on the cultures and places of Pre-Colombian America. While we do plan to do all of the native cultures, we are starting with 4 cultures, Pacific Northwest, Eastern Woodlands, Inca, and Aztecs. In order to add more depth and interest to the game, we have also added the mythical monsters from native cultures from all over the Americas. We here at Paymaster wanted to show that the Myths of the Native American cultures were just as valid as those from the Europe and far east. Please watch Kickstarter for a couple of our campaigns which will be up soon. So keep an Eye out. We will be making updates as we get them. Oh, if you want in on the play testing of Going Native: Warpath, please do not be shy and contact us at playtester@paymastergames. Pay Master Games is having a holiday sale on their miniatures. With the holiday's in mind and the time it takes to for shipping the item to where ever you might be. I am lowering the prices on all the models by $2 for a time. Also i will be offering free or reduced shipping if you buy $50 or more of products. I was made aware that the webstore was not working for International Customers. This was very unfortunate, and I am working on this problem right now but this may take awhile to fix. In the mean time I have created a Paypal order form on the store page for out international customers and for US customers that want to use Paypal models. I hope this helps you guys. Finally after a lot of work, several phone calls, and half a case of Mountain Dew the Web Store is finally up and running. 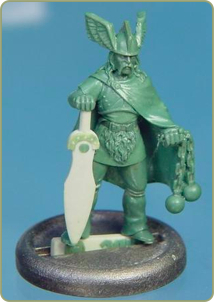 For now we are using the greens of our models as the pictures in our store, but we will be replacing those greens with painted models as we get them done. Retailers that want to sell our models please send us an e-mail to get more information. If there is any one that went to Gencon and still has one of our cards or a label from one of our models, please e-mail us a scan or photo of that card or label to get a special offer code to use on your next order. 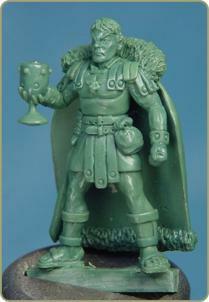 Here is a Picture of our best seller at Gencon, Marcus Crassus, The Richest Man In Rome. This is a launch of the new Paymaster Games web site. We are planning two product lines; here is a quick description of both lines: Main Line or Lines – Going Native: This is a historical line of models based on and inspired by the Native American and Polynesian nations and peoples of the not so distant past. 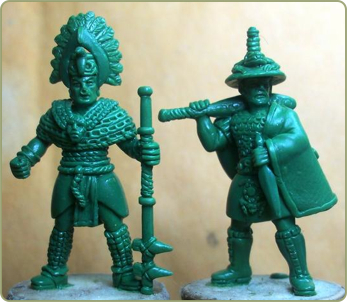 These models 28mm Heroic scale and will cover different armies of native civilizations including the Maya, Aztecs, Inca, Hawaiian, and many others. Right now our main focus at the moment is to supply models for the Field of Glory and possibly Clash of Empires game/rule sets, but we do plan to expand past this. Secondary Line – Heroes of History: This is a historical line that focuses mainly on famous generals and/or people that have directly or indirectly affected the course of history. These models will have a modern romantic appearance that will be a lot closer to a character in a historic setting video game, not unlike the Warrior Series made by Koei.